The Clan Stand is not an easy backdrop when you’re blowing the home team off the park, and at one stage in the second half, with Cardiff boosted by the gale force wind and the stream of penalties, you thought Mr Adamson would be best advised to order room service if he was staying overnight in Galway. In the end it didn’t matter. 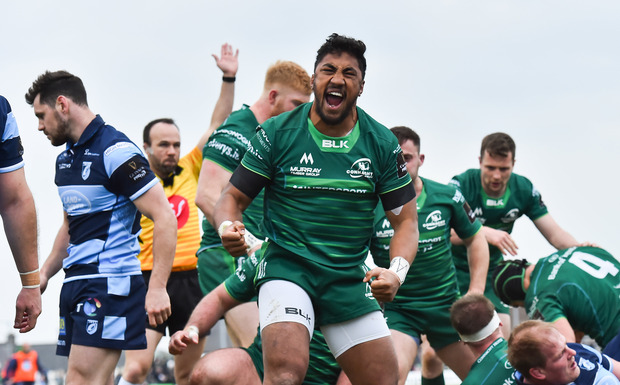 Connacht got the win they wanted, and the sell-out crowd of 6,229 drifted away happy at the prospect of a play-off away to Ulster in three weeks. Given the context of this time last season, when the Sportsground was a thoroughly gloomy gaff under then coach Kieran Keane, his successor, has lots to be happy about. “You want to be at the business end,” Andy Friend said. There were any number of big calls, but two in particular in the final quarter swung the game in favour of the home team. First, on 61 minutes, Jason Harries got over in the corner and there seemed to be simultaneous grounding between getting the ball down and putting his hand in touch in goal. Adamson restarted with an attacking scrum. And then, with a few minutes to go – by which stage Josh Turnbull had got over and Connacht’s lead was down to six points, Matt Healy got the thumbs up on a try that came directly from the restart to Turnbull’s try. The issue was whether or not replacement Robin Copeland had knocked on Carty’s restart. More cameras might have made the job easier for the TMO. It was always a dramatic game, and it didn’t dull on the run-in. There was even a bit of pulling and dragging after the final whistle, which arrived well into time added-on, with Cardiff scrambling for the seven points needed to tie the game and the home side desperately plugging leaks. On that front, man of the match Jack Carty more than did his bit. He managed to pull down the dangerous Owen Lane, despite being half-hobbled at the time, and had he missed him it could have ended differently. It’s hardly a unique occurrence for a game in the Sportsground to be attended by a strong wind, though less frequent is the gale that comes straight down the field off the College Road. Interestingly Cardiff, having won the toss, chose to battle into it in the first half. And battle it was. It never let up to the finish with the home team getting off to a flyer through Caolin Blade – that too needed TMO involvement – combining well with Paul Boyle to score. But by the break their lead of 14-7 wasn’t what had been budgeted. Owen Lane put Cardiff level on 20 minutes, and then Gavin Thornbury got over from a maul as Connacht passed up kicks on goal in search of something more. With the gale in their faces after the break their competitiveness was massive, and between Carty off the tee and over the ground they got out to 24-7 before Cardiff came back. It was absorbing stuff.